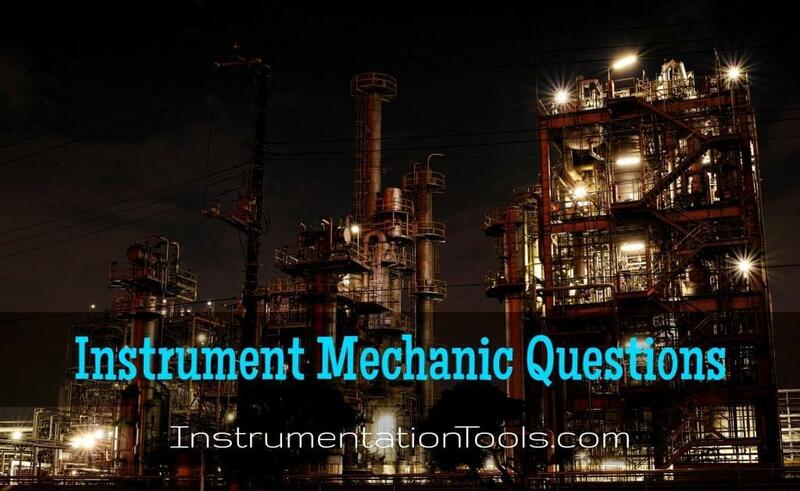 Read the following list of frequently asked Instrument Mechanic Interview Questions and answers for preparing your face to face interview. Explain about Venturi Meter ? It is the most widely used device for measurement of discharge through a pipe. A venturi meter works on the principle of pressure differential, that is , the flow velocity is greatly increased in a reduced section with which the corresponding pressure decreases, causing a difference in pressure between the tow sections. This pressure differential is measured and it is a measure of flow rate. From this the discharge can be calculated. The diameter of the inlet main or pipe and enlarged end of converging cone is same. In order to measure pressure differential U-tube manometer or separate pressure gauges are used. These are connected at upstream pressure tapping point (enlarged end) and at throat pressure Piezometer tube may be used. The short length of pipe tapers to a narrow throat. As the, liquid flows through the meter, the velocity will increase at the throat owing to the reduction of area, consequently the pressure will be reduced. The pressure difference between the inlet section and the throat is measured. Knowing this pressure difference, the quantity of liquid flowing may be calculated. Explain about Pitot Tube ? Pitot tube is the most commonly used instrument in the laboratory for measuring the velocity of flow. The tube consists of two concentric tubes. The inner tube with its open end faces the on-coming liquid. The outer tube has a closed end and has to eight holes in its wall as shown in fig. Pitot tube uses the principle of transforming kinetic energy of a fluid into potential energy in the form of static head. The Pitot tube is installed in a pipe line. The inner tube with its open end faces the on-coming liquid. The velocity of a fluid across a section of pipe is not uniform but varies from zero at the pipe (inlet) surface to a maximum usually at the center of the pipe. Let P be the pressure at inlet. This pressure is also called stagnation pressure, where the velocity is zero. The pressure in the outer tube is the static pressure, P0 in the line. The total pressure in the inner tube, however, is greater than this. The total pressure is static pressure plus the pressure due to the impacts of fluid stream on the stationary fluid in the stream. Explain about Orifice Flow Meter ? An Orifice meter works on the same principle as venturimeter i.e. if the cross-sectional area of flow is decreased, a pressure difference is created. An Orifice plate having a sharp edged concentric circular hole is clamped between two pipe flanges. The pressure difference is measured between two sections 1 and 2. Section 1 is at a distance of D1 to 2D1 upstream from the orifice plate. Section 2 is located at a distance of D1/2 from the Orifice plate on the down stream side. Section 2 is the point of vena contracta. This is the point where the liquid jet coming out from the Orifice has the smallest diameter. Hence highest differential pressure is obtained at this point. A u-tube manometer or pressure gauges at this point is used for the measurement of differential pressure. The jet coming out of Orifice gradually expands to fill the pipe. Due to this change of cross-sectional area some eddy currents are set up which causes dissipation of energy and loss of head. Explain about Orifice Plate ? An orifice plate has a sharp edged concentric circular hole. The standard concentric plate is normally made of stainless steel from 3 mm to 12.5 mm thick depending upon size of line. Some orifices are made with one side of hole beveled at 45 degree as shown in fig. The function of the orifice plate is produce restriction to the flow. The flow velocity is greatly increased in a reduced section. Explain about Bellows Pressure Gauge ? A metallic bellows is a series of circular parts which are formed or joined in such a manner they are expanded or contracted axially by changes in pressure. Materials commonly used are brass, bronze, beryllium copper, alloy of nickel and copper etc. Bellows elements are used for the measurement of absolute, gauge and differential pressure. A bellows pressure gauge is shown in fig. There are two bellows. A and B. The pressure applied to bellows A is Pa and to bellows B is Pb. In case it is desired to measured the absolute pressure. When gauge pressure is to be measured, than bellows B is opened up to atmosphere with pressure Pb is equal to the atmospheric pressure and therefore the reading of scale is the gauge pressure. The differential pressure P=Pa-Pb is measured when pressure Pa is applied to bellow A and pressure Pb is applied to bellows B. The gauge records pressures by means of expansive and construction of flexible metal bellows, these being transmitted to an optical lever of high sensitivity and then to the pointer. Explain about ‘C’ type Bourdon Tube Pressure Gauge ? A bourdon pressure gauge consists of a tube which is oval in section and is formatted into arc in the form of C. One end, called the tip of the tube is sealed and is called free end. This is attached by a light line-work to a mechanism which operates the pointer. The other end of the tube is fixed to a socket where the pressure to be measured is applied. The vessel, whose pressure is to be measured, is connected with the socket. The internal pressure tends to change the section of the tube from oval to circular and this tends to straighten out the tube. The movement of the tip is ideally proportional to the pressure applied. The tip is connected to a spring loaded link work and a geared sector and pinion arrangement which amplifies the displacement of tip and converts into the deflection of the pointer. Explain about Dead Weight Tester ? Dead Weight Tester is used for calibration of gauge. The chamber and cylinder of the tester are filled with clean oil. The gauge to be tested is fixed at its appropriate place and piston is inserted in the cylinder. The pressure is exerted on the fluid and this pressure is transmitted to the gauge deflecting its pointer. A weight is placed on the piston and its position is adjusted to get the desired setting of the gauge pointer. Now the pressure is changed by forcing in the plunger with the help of the handle. The handle is moved till enough pressure is built up to lift the piston weight combination. Under these conditions, the piston weight combination floats freely. This fluid force is balanced against the gravitational force of the weights plus the friction drag and equilibrium is set up. The accuracy of dead weight tester is affected by friction force between the piston and cylinder and due to uncertainty of value of gravitational constant g.Industrial pressure gauges, engine indicators etc. Be calibrated by dead weight tester. Explain about U-Tube Manometer ? A device to measure the of an enclosed gas is called a pressure gauge or manometer. The pressure of a gas can be measured with a U-tube manometer as described below. The U-tube manometer shown in fig. May be used for measurement of liquid or gas pressure. It consists of U-tube open at both ends. One end is connected to the vessel whose pressure is to be measured and other opened to the atmosphere. Suitable liquid like water, mercury or oil may be put in the bend of the U-tube. The choice of the liquid will depend on chemical affinity of the gas with liquid used. The density of this liquid should be known. The difference between the pressures on two limbs of the manometer is given by h, the difference between the levels of the manometeric fluid in the two limbs. The height h can be read off a scale placed alongside the U-tube. Knowing the atmospheric pressure, the pressure of the gas in the enclosure will be p ± h.g.d., depending on the pressure head being positive or negative. d = density of the liquid the manometer. Explain Different Measurement Of Temperature Devices ? Physical properties of matter very with temperature in a measurable way then that properly can be made as the basis of a thermometer. Each one of the above instrument is based on different principles. 1. Resistance thermometer is based on the fact that the electrical resistance of metals varies with temperature. 2. Gas thermometer is based on the fact that gases expand by quite large amounts on heating and their pressures also increase by large amounts, so they can be used to measure even a small rise in temperature. 3. Vapour bulb thermometer is based on that the pressure exerted by the vapour of a liquid gas depends only upon its temperature. 4. A thermocouple is based on the principle that when dissimilar metals are joined together, the application of heat to the joints causes a small electric current to flow. 5. A thermo-electric pyrometer is based on the principle that when two wires of different metals are joined to form a complete electric circuit and one junction is at a higher temperature than the other, an electric current flow in the circuit. 6. The basic principle of optical pyrometer is that it compares the intensity of light being emitted from the furnace with that of some standard source. 7. A bimetallic thermometer is based on the principle of unequal expansion of different metals with the change of temperature. Explain about Optical Pyrometer ? It works on the principle that the intensity of radiation from a calibrated standard source is varied and to match the intensity of radiation from the source. The pyrometer consists of a telescope having an objective lens at one end and an eye-piece at the other. An electric lamp is placed in position with filter and absorption screen on either side of it. The lamp filament can be heated by adjusting current through it. The radiations from the hot body are focused on the filament of the lamp by adjusting the objective lens O. The current through the lamp filament is made variable so that lamp intensity can be adjusted. The filament is seen through an eye-piece and of equal brightness. When this happens, the outline of the filament disappears. The filament would appear too bright, if temperature of filament is higher than that required for equality of brightness. It appears dark, if temperature is lower. The filament current is so adjusted with the help of rheostat that it becomes invisible against the image of hot body. In other words, the filament optically disappears. In that case temperature of hot body and filament are same. Explain about Mercury Thermometer ? This thermometer is based on the principle that mercury expands uniformly on heating. It consists of a long capillary tube of glass with a uniform bore. A bulb is blown at one end pure and dry mercury is filled in the capillary tube from above by alternate heating and cooling of the bulb. Then the tube is hermetically sealed off at the upper end. The lower fixed point and the upper fixed point are marked at the temperature at which pure ice melts and temperature at which the pure water boils under normal pressure respectively. The distance between the fixed points is divided into a number of equal sized parts called degrees and the thermometer is named accordingly. In the centigrade scale or celius scale the lower and upper fixed points are 0 and 100 and the distance between the fixed points is divided into 100 equal parts. In the Fahrenheit thermometer the lower and upper fixed points are marked as 32 and 212 and the distance is divided into 180 equal parts. In Reaumur thermometer, the lower and upper fixed points are marked as 0 and 80; and the distance is divided into 80 equal parts.